The story of St. Vincent Distillers began in the early 1900s, when sugar was the main crop on St. Vincent. The Mt. Bentinck Distillery, as it was known then, built a distillery in the foothills of La Soufriere Volcano to make use of the readily available molasses from the sugar factory next door. Trouble and tough times for the distillery came when bananas replaced sugar cane as the main source of the island's economy, forcing the distillery to import molasses. It wasn't until 1996, when the Government sold the business to C.K. Greaves & Co ltd., one of the island’s most successful businesses, that the St. Vincent Distillery started to flourish again, and has since won many awards in international Rum tasting competitions. Captain Bligh XO Rum Special Reserve is their most recognized and acclaimed Rums. It was named after William Bligh, an officer of the British Royal Navy known for the mutiny that took on the HMS Bounty, where he was set adrift by sailors under his command in 1789. In an extraordinary feat of seamanship, Bligh navigated the 7 m open launch on a 2 year voyage to Britain to report the mutiny to the Admiralty. Later, the captain took command of another vessel, and during his command, brought breadfruit plants to St. Vincent from Tahiti. In 1808 he was faced with another mutiny, as he attempted to stamp out the corruption in the Rum trade in the region, resulting in the so-called Rum Rebellion – the only successful armed takeover of the government in Australian history. Captain Bligh XO Rum Special Reserve is made from fermented molasses imported from Guyana, distilled in a modern two-column stills and aged for up to 10 years in ex-Bourbon casks. It has won quite a few awards in the past decade, but was mostly under-appreciated until 2014, when it was named the Best Rum at the World Rum Competition. So, don't let the unassuming bottle confuse you. Captain Bligh is a proper Rum. 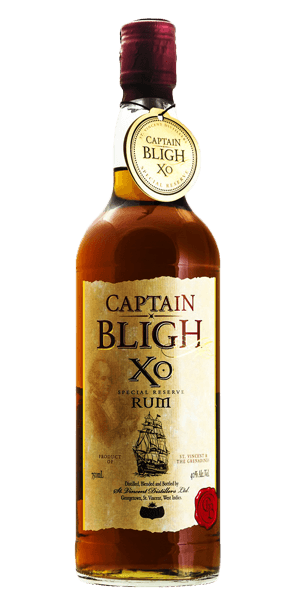 What does Captain Bligh XO Special Reserve taste like? The Flavor Spiral™ shows the most common flavors that you'll taste in Captain Bligh XO Special Reserve and gives you a chance to have a taste of it before actually tasting it. Delicate with light caramel, brown sugar, vanilla, coconut milk, green lawn and balanced scents of oak. Smooth, with solid oak notes, vanilla and caramel.